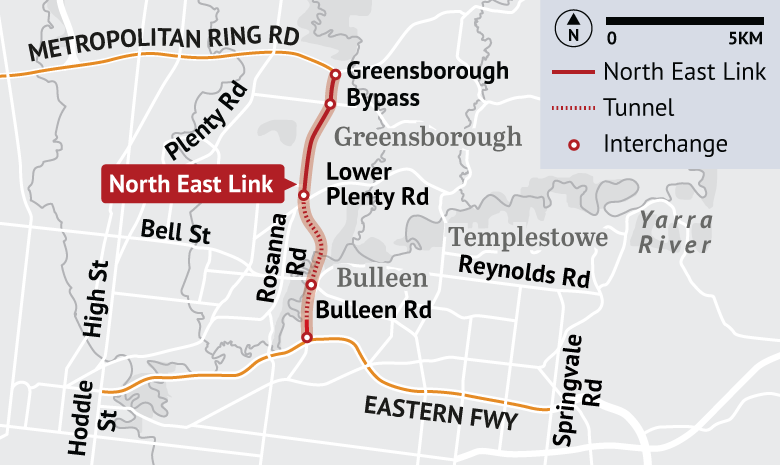 The Eastern Freeway will swell to more than 20 lanes at its widest point – rivalling some of the world’s widest roads – under the state government’s plans for its $15.8 billion North East Link. The state government released more detailed plans on Sunday of the city’s “missing link” road, billed as Victoria’s biggest-ever road project and featuring nearly 5.8 kilometres of tunnels carrying six lanes of traffic. But it is the behemoth new intersection at Doncaster that catches the eye, with its 14 lanes of traffic, four emergency, two bus lanes and on- and off-ramps rivalling some of the world’s widest roads. Labor has promised the road would go out to tender within 100 days if is re-elected in November, with construction to start in 2020 and the road to open in 2027. Premier Daniel Andrews said on Sunday the link would be Victoria’s largest-ever road project and would create 10,000 jobs while under construction. “It is a big project and it adds to an already enormous infrastructure agenda,” the Premier said.